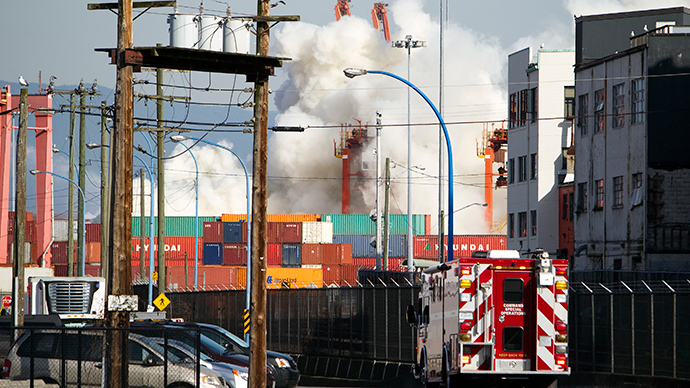 ​A hazardous chemical fire that engulfed several containers at Vancouver’s Port Metro has prompted a partial evacuation of the smoke-cloaked waterfront. Rescue services have been deployed to contain the incident and health warnings have been issued. Residents are advised “to stay inside and close windows,” as hazardous material burns out of control. “The chemical can irritate the eyes and lungs,” said Vancouver Coastal Health spokeswoman Tiffany Akins, referring to trichloroisocyanuric acid, a respiratory irritant. An Emergency Operations Centre has been established to coordinate the work of fire, police, ambulance, engineering, social services, transit and other agencies. The port released a statement saying they have received reports that a container was on fire at the Centerm container terminal at 1:40 pm. Initially at least eight fire trucks and more than two dozen firefighters responded. Fire boats were also dispatched from the north end of Centennial Pier. “The Centerm container terminal and nearby port properties have been evacuated. All south shore of the Burrard inlet port operations have been shut down, including rail and truck access. Vancouver Fire and Vancouver Coastal Health are on-site and actively determining if any additional evacuations are required,” Port Metro Vancouver said. No injuries have been reported so far. Public transport has been disrupted by the accident.